How do you put a person's life on film? What parts do you put on film? Does it change when the subject is beloved, or young, or recently deceased, or all three? Three of the four movies I saw at Sundance on Monday were biographical documentaries -- sometimes the monkeys type Shakespeare -- and while all three were very good, only one was great, and the reasons go to the heart of why we commemorate. Cinema is an unparalleled medium for audio-visually summing up a person's life and assigning it meaning in a neat 120 minutes, more or less, but filmmakers need to ask themselves (and the honest ones do) whether they want to take the full measure of their subjects or present them in their best light. Whether they want to tell us something or sell us something. The three bio-docs on my docket were "Finding Fela," "The Internet's Own Boy: The Story of Aaron Swartz," and "Life Itself," the latter a documentary about movie critic Roger Ebert. Of the three, "Finding Fela" is probably the most straight-up: An attempt by the indefatigable Alex Gibney ("We Steal Secrets: The Wikileaks Story," "The Armstrong Lie") to remind us why Fela Anikulapo Kuti was the most kickass musical revolutionary to ever come out of Africa and a cultural game-changer on the order of James Brown and Bob Marley. 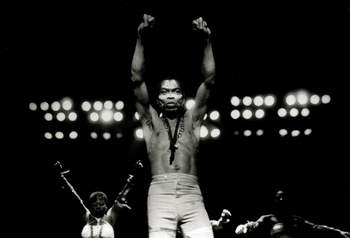 The project had its origins in the recent Broadway production of "Fela!" and, more specifically, co-creator Bill T. Jones' struggles with notions of representation, authenticity, and Fela's less salutary character traits. At a certain point, Gibney seems to have realized that the only way to bring the audience in on that struggle was to make the film as much about the real Fela as the Broadway version. The story, if you don't know it, is one of the great sagas of post-WWII world-music culture: How a Nigerian kid from a wealthy family incorporated James Brown funk, Yoruba chanting, and insanely tight horn charts into a music that united sub-Sahara Africa into one giant late-60s dance party. How weed, women, and politics turned Fela into a unique figure: A dangerous radical hedonist. How he and his entourage literally seceded from Nigeria into a Lagos compound, and how the army mounted a raid that killed the singer's mother. How jailings and beatings made him more defiant. How he taunted generals and lorded over women, marrying 27 girlfriends in one profligate ceremony. How he died in 1997 of AIDS in a country too scared to talk about it. As Jones wrestles with how much of this messy, charismatic life a Broadway audience can handle, Gibney lays out the full picture, availing himself of terrific concert footage, archival materials, and interviews with Fela's colleagues and family. The unstated theme of the film -- aside from highlighting the unstoppable groove of the music -- is the very purpose of biography, whether we use it to earnestly ennoble or dispassionately record. In the case of "The Internet's Own Boy," the purpose is clearly to ennoble, and anything else might be seen -- at this moment in time, anyway -- as blasphemy. Aaron Swartz, of course was the computer programmer/activist whose suicide in January of 2013 came as the US government was preparing to prosecute him for downloading documents from an academic database; his death galvanized the online community, who saw (and see) him as a martyr for open access and the democratic future of the Internet. Director Brian Knappenberger leads us through Swartz's short, initially charmed life from beginning to untimely end, starting with adorable family videos of his toddler years. We learn of his pioneering efforts co-creating RSS and Reddit in his early teens and his growing political disenchantment and commitment to change. "The Internet's Own Boy" is deft at explaining knotty technical developments and it gives Swartz mentors like Lawrence Lessig and Tim Berners-Lee -- the people who've built our online universe and are intent on protecting it from centralized government control -- ample room to state their case. We don't hear much of anything from the other side (US attorney Stephen Heymann is a Voldemort glimpsed only in grainy photographs) and, anyway, Knappenberger and his audience are less interested in journalistic balance than in eulogy and advocacy. Which is fine, but a more nuanced portrait of Swartz might have acknowledged, as some print reporting has done, that he had his darker side and depressions, and that the abilities that made him a genuine prodigy also set him apart from the world and ill at ease in certain situations. That the idealism that fired his political zeal (and had real and critical results, such as the failure of SOPA to pass) appears to have had its naÃ¯ve side, which he might have outgrown had he lived. 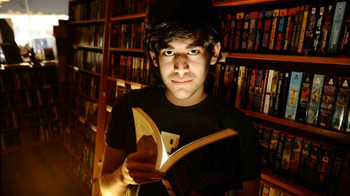 That however draconian the government's persecution may have been, it was Aaron Swartz's decision to end his own life. But Knappenberger can't paint his subject as a warts-and-all human because Swartz simply means too much to too many people right now. He's a focal point for social and political change, with communal grief as its engine. "The Internet's Own Boy" works very well on that score -- the Sundance audience was in tears of sorrow and outrage by the end -- and Knappenberger easily convinces us of the enormous hole left by his subject's passing. Aaron Swartz might have gone on to change the world in so many ways; instead, his choice robbed us of all he could have done. Roger Ebert, by contrast, was just a movie critic, and -- trust me on this -- that's a lesser field of endeavor than trying to better the world through music, computer code, or activism. Except that Ebert's life easily spilled over the edges of that two-word container, and it's the achievement of Steve James' wonderful, heartbreaking "Life Itself" to give us the whole man in all his personas, some graceful, some not-so-nice. The movie reminds us that Ebert came up as a classic old-school newspaperman, and a Chicago newspaperman at that. It covers his battles with alcoholism early in his career, his struggle with catastrophic illness and debility toward the end, and his fights with Gene Siskel in the middle. James includes outtakes from Siskel and Ebert's syndicated "Sneak Previews" show where the two rip into each other with an intensity of purpose that's both funny and appalling. Ebert had an ego, and James ("Hoop Dreams") knows his film can't be complete until we see it. But Ebert also had passion, depth of knowledge, a sense of fairness, and a born journalist's facility with language; he wanted to share the best that movies had to offer because he knew the best ones could not only change how you saw the world but what you did in it. "Life Itself" addresses the charges that Siskel and Ebert dumbed down film criticism into a binary thumbs-up/thumbs-down judgment call, and it finds those charges warranted to some degree and not in others. This is what I mean by nuance. 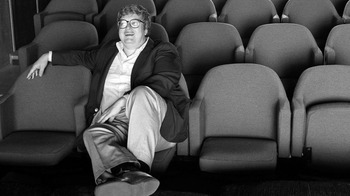 The scenes shot in the final months of Ebert's life are quietly heroic, the critic responding to endless physical indignities with a growing purity of affect, his wife Chaz shouldering a burden that would stagger you or me, and still "Life Itself" shows the couple snapping at each other every so often, just to reminds us they're human. That's what makes this a great documentary rather than a very good one: James comes to his subject with respect and affection, but he understands that a documentarian's job is to assemble the paints and then allow the portrait to paint itself.